Pretty sure he means those 4 sizes on the two bass drums as the above rare Tama Lars Granstar 2 kit was in the classic 9 piece setup. Not 8 10 up front and 14 16 floor toms on the right. Danny Carey uses an 8 10 14 16 Tom setup. So you’re saying this too is too “drastic”?? It would be for me. Three inches is the biggest gap I like between toms. 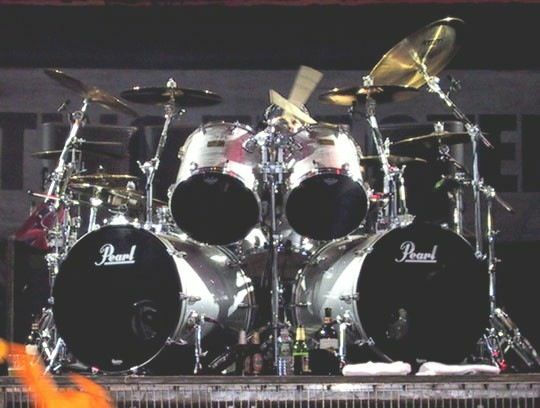 I think for me regarding Carey’s kit is the 8 and 10 being the two rack toms. They are way too high pitched for me in that role. I know from trying it firsthand. The only time it’s worked for me is when I’ve gone 10, 13, and 16. I can see that. It’s a classic combination. I also have the traditional 12, 16, and 20 or 22 combination. I love that kit. I just wish I stuck with my gut and had a 15 instead. I have owned a lot of kits in my day and I can't say I miss any of the ones I have sold. Not my Collectors kit, not my Recording Customs, not my Pearl wood/fiberglass kit, none of the cheap ones. None of them. Now, I do have a Mapex Saturn III kit that is currently in bags not being used that I will not part with. I know if I sold it I would miss it dearly. Some things you just know you shouldn't part with because you will never be able to get them again (at least not in the same condition as what you had). For my Saturns, they are in like new, flawless condition. I would never be able to find this kit again in this condition. If I'm lucky I could get $800 for it and for that money I would rather keep them as a time capsule than sell them . I know what you mean. I’ve considered moving back to a maple kit but I know that if I gave up my #159 MM BRX I’d always regret it. I like my BRX just fine but I really do miss my #406 Bronze Glass MCX. For my $, there is no better line of drums for the money than the original MCX's. Full maple, nice size choices, great colors, die-cast hoops... and for a fraction of the cost of similar "pro"-level kits. I got on a kit at GC years back. My buddy, who had a beautiful DW kit at the time, thought the MCX was the best sounding kit in the shop hands down. It was hard to disagree. #1 is my Tama Superstar kit. I had 8"-15" rack toms although I could never get comfortable with the full setup. I settled on 2 up and 1 or 2 down. Great kit. #2 My first kit was a Silver Sparkle '71 Ludwig kit purchased used in 1980. I'm much better at tuning now than I was back then and I'd love another stab at them. My only other kit aside from the two I own now was a late 90s Premier XPK Limited Addition set. Great drums for the money and by default I'll include it here. Paiste 2000 Sound Reflections. Nice.